Come and sample our programs with one of our many sewing and handwork workshops. All participants will take home a project at the end of each workshop. All supplies and materials included. No previous experience necessary. Available upon request! Grab a group of your friends and join us(minimum of 3 guests to run the event). At our Narberth Studio, 35 N. Narberth Ave. Call us at (610)660-9600 to book now. Narberth Studio to participate in beginner friendly hand-embroidery workshops for adults. 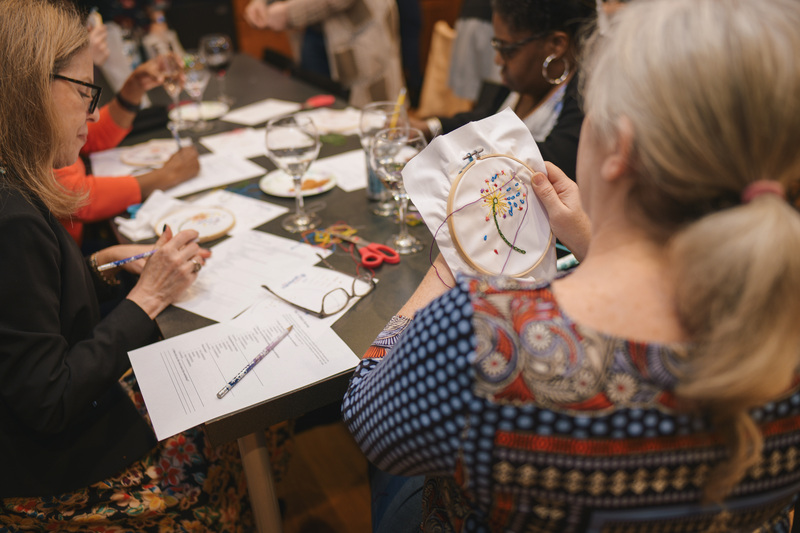 Our fun and knowledgeable instructors will teach you step-by-step on how to embroider a design of YOUR choice. By the end of clas, you will have a one-of-kind keepsake. All materials are included & no experience is neccessary (yes, even if you can't thread a needle that is OK!). Just bring a beverage of choice (snacks are welcome too) and come ready to have fun! Must pre-register to ensure proper staffing and supplies. Available upon request! We work with you to book a date and time that works with your schedule. For more information on Alex's Lemonade Stand, please visit their website. The event will take place at our studio on March 8th from 7:30pm - 9:30pm. We will teach you some new embroidery skills and give you a place to have fun with your friends. Registration required to ensure proper staffing and supplies. We hope to see you on March 8th! Save 10% on each child you register after your first! Call the studio for your discount (610) 660-9600.